The events are held on the Columbia University campus, usually in one of the lecture halls at the Department of Slavic Languages, Hamilton Hall, seventh floor. There are also off-campus lectures/presentations in other U.S. cities and in other countries. The UFCCU has held screenings at Rutgers, Ohio State, and Harvard universities, the University of Toronto as well as at non-academic venues in Philadelphia, Edmonton, Toronto, Chicago, Hartford, CT, Yonkers, NY, and other cities. The Club offers its film collection and expertise to facilitate film presentations on invitation from interested parties outside Columbia University. Inquiries should be sent to Yuri Shevchuk. The on-campus events usually take place every third Thursday of the month at 7:30 PM during the regular academic year with Christmas and summer holiday breaks. The events are announced on this website as well as on various internet mailing lists, Brama, in the Ukrainian Weekly and at other New York City universities such as New York University, City University of New York, the New School for Social Research and, of course, Columbia. Yuri Shevchuk will introduce the guests and mediate the discussion. The event is free and open to the public. To read the story behind the film. Stefan Bugryn is an Australian director & producer based in Melbourne, Australia. Since 2012, his shorts have screened locally and internationally at festivals such as the Melbourne Documentary Film Festival, Sydney Film Festival, FilmQuest, and Middle Coast Film Festival. In 2018, Stefan won Best Director: Short Film Category, and Best Short Film at the 2018 Melbourne Documentary Film Festival for the first instalment of his War Mothers documentary project. The premiere of this film was officially backed and supported by Time Out Australia. Steven Zelko holds a BA in Cinema and English, and has been actively making films for the past 10 years. He has worked in both fiction and non-fiction, education, music, and drama, and has shot everything from a feature film about aliens, to a family program about saving marriages for the Victorian Government, to Iron Maiden performing to a sold out audience at Rod Laver Arena. Steven grew up the son of Yugoslavian migrants who settled in Melbourne in the 1960’s. He was an active member of that community until the Bosnian war in the early 1990’s, a war which cost him the life of his grandfather. He currently spends part of his time working for LaTrobe University production department, assisting students with disabilities. Since its inception 14 years ago, the Ukrainian Film Club of Columbia University has primarily focused on the work of directors and actors. Now for he first time, we would like to take a closer look at producers, the profession that is relatively new and in the process of defining itself in Ukraine’s contemporary film industry. Producer Olena Yershova will be present at the screenings of Frost and Volcano to discuss her work and the current state of the Ukrainian film industry. All films are with English subtitles. Every event is free and open to the public. The retrospective is scheduled to take place at Columbia’s Deutsches Haus, 420 W116th Street, New York, N.Y.
Volodymyr Tykhy’s “Brama”. A Review. A few weeks ago, I went to see Volodymyr Tykhy’s Brama (Ukrainian: Брама) on an incredibly last-minute whim. Interrupted during a Skype call on one of my last days in Lviv, I was promised that the film had received rave reviews and that I had to see it because it was actually a Ukrainian-made film, not just another Ukrainian-dubbed Hollywood hit. And so I wrapped up my Skype call and headed to the cinema, knowing nothing other than that the title Brama meant ‘gate’ or ‘portal,’ a tidbit I had learnt a few weeks prior when reading up on the Zaborovskyi Gate at St. Sophia’s Cathedral in Kyiv. I’ll admit right off the bat that my knowledge of Ukrainian and Russian combined was not always enough to understand every line of dialogue in the film. Nevertheless I was able to understand the better of the plot despite the characters speaking with dialectical quirks and surzhyk. Tykhy’s Brama centers on a three-person and three-generational family residing in the Chornobyl Exclusion Zone in present-day Ukraine. At the head of this family is Grandmother Prysia, a seasoned veteran of many life struggles, including Nazi invasion. Grandmother Prysia’s daughter, Slava, on the other hand, is of weak character and is depicted as sickly, lazy, and shameless. She is a symbol of the new, ‘lost’ generation of Ukraine. Slava’s husband, and father of her son Vovchyk, long ago deserted the family. His disgust at his life, his wife, and Vovchyk who suffers from some unspecified mental handicap propelled him to leave the Exclusion Zone. Trauma, Resiliency, and Remembrance in Ukrainian Cinema. The Case of The Guide and The Tribe. On August 24, 1991, in the wake of a failed coup in Moscow, the Ukrainian parliament declared independence. A few months later, in December of that year, 90% of voters chose to ratify this declaration through a referendum, transitioning Ukraine into a postcolonial, post-Soviet state grappling with questions of national identity. Film became national cinema, aiming to mythologize the legacy of the Ukrainian people through their collective adversity under Soviet rule in the 20th century. The myth building of culture culminates in national experience, which differentiates the nation from other communities through its confrontation with antagonistic forces that seek to destroy it. Andrew Higson notes, “Histories of national cinema can only therefore really be understood as histories of crises and conflict, of resistance and negotiation”. As such, contemporary Ukrainian cinema focuses on the nation’s past maltreatments, “built up on a binary opposition between self and other, where the other [is] the intruder, the colonizer, the enemy” (Pavlyshyn). The two films this review examines, The Guide (2014) and The Tribe (2014), each focus on marginalized communities that persist in opposition to an antagonistic colonizer, whether the Soviet state or, in the case of The Tribe, the apathetic environment leftover from colonization. Viewed together, these films demonstrate the importance of reclaiming past traumas and acts of resistance in post-Soviet Ukraine, crafting a national identity that remains acutely aware of the extreme violence it has been forced to endure through decades of subjugation. True to its mission of giving international exposure to young Ukrainian filmmaking talent, the Ukrainian Film Club held a special screening of "The Ukrainian Sheriffs". 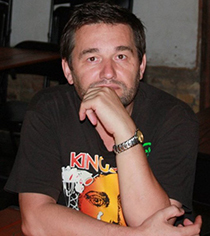 The feature documentary was directed by Roman Bondarchuk and produced by Dar'ya Averchenko. For both the film is their debut in the genre of the feature length documentary. The very well attended Columbia screening was immediately followed by another such event at the Ukrainian Institute of America in New York, N.Y. on December 7. Both were attended by Mr. Bondarchuk and Mrs. Averchenko who were in the United States promoting their film, which is Ukraine's official entry for the Oscar consideration in the best foreign language film category. Pigs Are Always Pigs (Pupky Station), a silent comedy produced at the Ukrainfilm Odesa Film Studio in 1930 by director Khanan Shmain, was long considered lost. 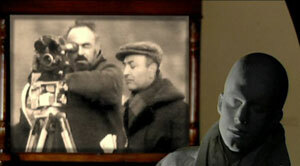 Last year, the Russian film scholar Piotr Bagrov discovered the film in the Bundescarchiv German Federal Archives. The director of the Bundesarchiv contacted Mr. Ivan Kozlenko, the director on the Oleksander Dovzhenko National Film Archive in Kyiv in February 2015 with the offer to transfer the seven reels of film, both positive and negative prints, that were in their collection to Ukraine. It was arranged for the film to be sent by diplomatic post. Pigs arrived in Ukraine on August 22. February 24, 2014, New York, N.Y.
Fedir Aleksandrovych (left) and Artem Ryzhykov at Columbia event. The Ukrainian Film Club at Columbia University held an event with Fedir Aleksandrovych and Artem Ryzhykov, two Ukrainian crew members of the feature documentary "The Russian Woodpecker", dir. Chad Gracia, US-UK-Ukraine coproduction, which has just been awarded the Grand Jury Prize in the World Cinema Documentary category at the hugely prestigious Sundance Film Festival and is headed for theatrical release and distribution in the U.S. in the near future. Mr. Aleksandrovych conceived the idea of the film and appear as the narrator in it. Mr. Ryzhykov is its cinematographer. February 22, 2015, New York, N.Y.
Filmmakers from Kyiv sharing insights on the mystery of Chornobyl catastrophe at Columbia. On February 19th, the Columbia University community had a unique opportunity to talk with two members of the team behind the winner of the 2015 Sundance Film Festival's prestigious World Cinema Jury Prize for a documentary feature - "The Russian Woodpecker." Fedir Aleksandrovych, a theatrical artist and the documentary's main figure, and Artem Ryzhykov, the cinematographer, were present to discuss the film's conception, research, and other behind-the-scenes details. February 10, 2015, New York, N.Y. Written and directed by established Ukrainian director Volodymyr Tikhyi, The Green Jacket (2013), Zelena Kofta in Ukrainian, is a psychological thriller that exposes our most human vulnerabilities. February 9, 2015, New York, N.Y.
Myroslav Slaboshpytskiy’s The Tribe is perhaps the most-talked about Ukrainian film since independence. More importantly, it has been the most internationally decorated film by a Ukrainian film director ever. January 29, 2015, New York, N.Y.
October 16, 2014, New York, N.Y.